Marriages are no more the hearty union of people. Lousy decorations, pre-wedding shoots, post wedding shoots and the poor stunts to garner likes and comments on Facebook overshadowed the real idea behind marriages. Trends have spoiled it in recent days, as the popularity of DSLRs grew with age, people are now more leant towards getting candid photographs. Instead of getting married in an ordinary way, people are now imitating Bollywood’s essence and working hard to reflect that style in their wedding videos which are quite commonly impossible and will look more eccentric. 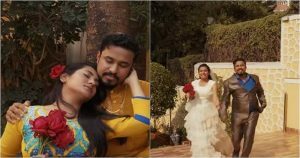 In order to let people know how actually their pre-wedding videos look like, the stand-up comedian Abish Mathew’s came out with a parody of the pre-wedding video. The hilarious video highlighting the awkward poses, cheesy romance and the inevitable slo-mo running is spot on, and going viral YouTube.